Originally published in the Informanté newspaper on Thursday, 26 July, 2018. We’re never actually standing still. At any moment, we’re rotating around the earth at 460 meters per second, the earth is orbiting the sun at 108 000 kilometers per hour, and the sun is orbiting the galactic center at a speed of 828 000 kilometers per hour. Even the moon rushes around the earth in its orbit at 3 660 kilometers per hour. During all this movement, sometimes, we get a rare occurrence. When everything lines up to create a spectacular sight. And that, dear reader, will be Friday night, the 27th of July 2018. At 19h14, the moon will begin its penumbral eclipse. It will start to enter the earth’s penumbral shadow, or partial shadow. When viewed from the moon, it will seem like a partial solar eclipse, with the earth beginning to obscure part of the sun. 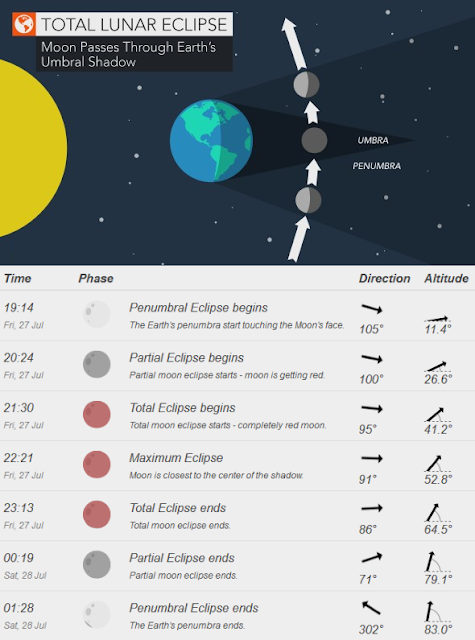 By 20h24, a partial eclipse will begin. Parts of the moon will start to enter the earth’s umbral shadow. Should you be on that part of the moon, it will appear like a solar eclipse has started – with the earth completely covering the moon. However, unlike a solar eclipse seen from the earth, the solar eclipse seen from the moon is a bit different. The earth, unlike the moon, has an atmosphere, which means that the light from the sun is not sharply cut off at the edges as the moon does when it causes a solar eclipse. The light from the sun is diffracted and scattered by the atmosphere of the earth, yielding a faint glow of the moon. The scattering of light, known as Rayleigh scattering, is also the reason the sky is blue – the atmosphere scatters lower wavelength light much more than higher wavelength light, such as reds. This is the reason sunsets are always such brilliant hues of reds and oranges, and this means that while the sunlight refracted around the earth to the moon is scattered, the blue/violet part of the spectrum gets scattered into the earth’s atmosphere. The reds and oranges, however, reaches the moon and gives it a reddish colour. The result – a blood moon, as it is called. By 21h30, the moon will have moved in its entirety into the earth’s umbral shadow. No matter where you are on the moon, you’d see a total solar eclipse, with the landscape solely lit by earthlight refracting around our planet. The moon is entirely shadowed by the earth. But this is a unique confluence of events, remember? At this time of year, the earth is near its apogee, having reached its aphelion (farthest point for the sun in its orbit) on 6 July. As a result, the earth’s shadow is larger than usual. The moon, however, is also reaching its apogee at the same time, meaning that it’s moving comparatively slower around its orbit, and consequently moves slower through the earth shadow. But wait, there’s more! In this specific lunar eclipse, the moon is also in also straight opposition to the sun, meaning it will move through the centre of the earth’s shadow. When taken together, this means this lunar eclipse will be the longest in this century – it will remain in the earth’s shadow for 1 hour and 43 minutes, just short of the 1 hour 47 minute theoretical maximum. By 22h21 we will have reached the point of maximum eclipse, with the moon directly in the center of the earth’s shadow. Now would be a good time to look for something else – Mars. On 27 July, Mars will be at its closest to earth in 15 years. It, and earth, will be in a straight line with respect to the sun, meaning Mars will be at its brightest. And when the moon is in eclipse, Mars will be the brightest ‘star’ near it, a mere 57.6 million kilometers away. By 23h13 on Friday night, the total eclipse will end. Parts of the moon will emerge into earth penumbral shadow, and over the next hour, it will slowly become more visible, as its red sheen fades. By 00h19 the moon will be fully in the penumbral shadow, and by 01h28, the moon will shine at full brightness once again. Just a warning, however. The moon has long since been the subject of the greatest optical illusion in history. Photographs and visual inspections make the moon look bigger than it is in actuality – and it has done so for thousands of years. In actuality, the moon in the sky is always about the size of your pinkie finger’s nail when held out at arm’s length, no matter how it looks on the horizon, or its appearance in photographs. It always appears the same size in the sky as the sun, in fact. But that is a subject for another day. So on Friday night, take a walk outside. See the splendor of the sky in its full glory, and revel in the majesty of the universe at its reveals such a special and unique part of itself to you.